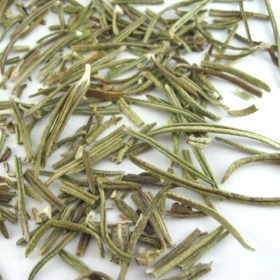 Rosemary Tea increases circulation and slightly raises the blood pressure warming the body from the inside out. Internally Rosemary Tea stimulates the liver and digestion, promotes blood circulation, tones up the blood vessels, invigorates, and increases your awareness. Use Rosemary Tea as a mouthwash for bad breath. Very aromatic with a hint of pine. Can be sweeten it with honey. Long, thin greenish-brown leaves. Rosemary tea by itself was nearly colorless. Fill 1-2 teaspoons of Rosemary to a cup (225ml) of boiling water.Steep it for 5 minutes. Add a squirt of lime juice if you like. Suitable for multiple infusions. Smells more than it tastes, but its great to blend with other herbal teas.